Jeremy Rhizor speaks at an oratorio performance on November 17, 2017 at Good Shepherd Episcopal Church in New York City. In the Book of Judith, the city of Bethulia controls the mountain pass through which the invading forces of Holofernes must travel to reach the city of Jerusalem and its Temple. The forces of Holofernes cut off Bethulia’s water supply, and Judith alone stands between the desire of her people to surrender and the intentions of Holofernes. If Bethulia was to surrender, the people of Bethulia would have to submit to the control of the invaders or be slaughtered, and the Temple of the Lord in Jerusalem would be destroyed. Judith walks a very fine line between making the situation of her people even worse than it already is and saving her people. She has limited power and does not control armies, and her bold plan has a high chance of failure. However, she responds to the situation at hand with a deep self-awareness and a firm trust in her God. She woos Holofernes and cuts off his head in the night. This one brave action changes the fate of her entire people. Although we might not be able to relate directly to her method, her story is an incredibly empowering message for people of every age. It encourages us to believe that radical positive change does not come from fame or military strength or money. Rather, positive change comes about when we respond to the call of the circumstance at hand by courageously pursuing the highest good with a deep understanding of the value of our goal. The story of Judith has been used historically as both a personal and a communal appeal to rise against the forces of evil (or the power of the invader) and to embrace one’s identity as it relates to God and neighbor. In today’s world the challenge of the Book of Judith can be tricky to confront. Everyone seems to be able to identify wrongdoing in others, but we often seem to overlook our own corrupted intentions and lack an understanding of what is truly good. The Academy of Sacred Drama’s timely focus on the story of Judith is a rousing and hopeful response to pervasive currents of contemporary discontent. To begin to respond to the realities of our own time, we turn first to the lessons of history. In this Academy Journal, Abigail Storch recalls an epic Anglo-Saxon poem that follows the life of Judith and parallels Beowulf in the age of the Viking invasions. Jane Tylus reminds us that, fittingly, dozens of Judith-themed oratorios were written during the time of the Ottoman-Venetian and Ottoman-Austrian Wars. And Elena Ciletti explores meditations on the Judith story from late Renaissance and early Baroque art. We bring the Judith story to modern times in an interview with Tony Ssembaya who is changing the conditions of his Ugandan community by enabling access to education for children. And we highlight the efforts of the Institute of Sacred Music at Yale as they explore other sacred-dramatic musical themes in a review of a Yale Schola Cantorum performance by Christopher Browner. This Academy Journal is just the starting point for ongoing discussions, and it is released in preparation for our upcoming performances of Antonio Draghi’s Oratorio di Giuditta. 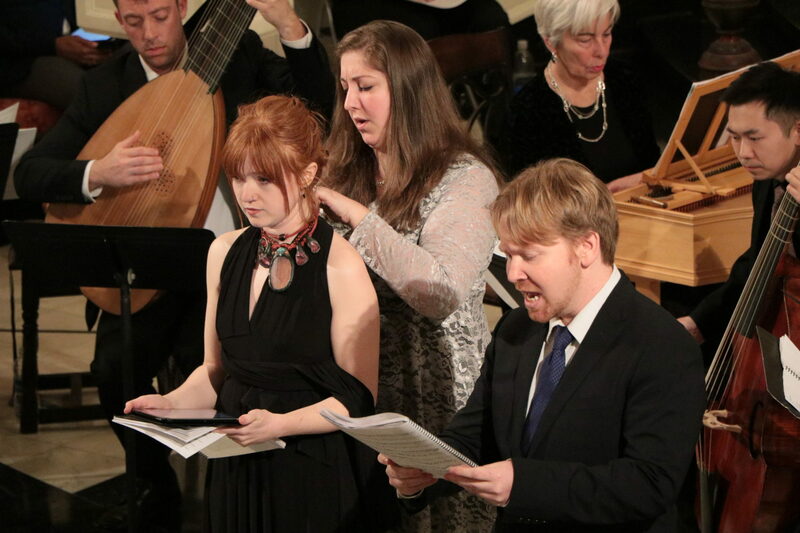 Our March 9, 2018 performance at Marquand Chapel at Yale Divinity School in New Haven, CT will mark the North American premiere of Draghi’s seventeenth century exploration of the Judith story. And on March 10, 2018 we will perform for Academy members and New York City concert goers at Corpus Christi Church. Academy oratorio performances are opportunities to engage both emotionally and intellectually with the timeless stories of the oratorio repertoire, and they provide a unique opportunity to make friends and explore opportune topics. As an artistic and intellectual academy, and as people of goodwill, let us courageously respond to the challenges of our time and circumstances. May we enrich our communities with great ideas, acts of charity, and well-placed creations in art and music. Jeremy Rhizor is a violinist, the artistic director of the Academy of Sacred Drama, and the publisher of the Academy Journal. He dedicates his time to exploring the world of sacred dramatic music and searching for appropriate boundaries in our understanding of the communal and individual nature of humanity. At the heart of the Academy of Sacred Drama is a communal effort to explore the world of sacred dramatic music. Lost oratorios and forgotten masterpieces are resurrected through the creation of translations and editions, their stories and contexts are explored in the Academy Journal, and they are performed in Oratorio Readings that mirror the format of their original presentations. The musical and textual material that we explore is in the public domain. The concept that printed works from past ages can exist for anyone to use, modify, or otherwise engage with recognizes that great ideas and works of art aren’t just the property of an artist and his or her descendants but have something to do with the contributions and identities of communities and even generations. Copyright might not sound as riveting as the topics of oratorio texts, but it plays an integral part in the Academy’s mission. The 2017–2018 season is the Academy’s Year of Judith. We’re taking three oratorios from the Baroque era and re-imagining them for modern times. Our first oratorio of the season is a Giuditta with music by Domenico Freschi and a libretto by Abate Francesco Silvani. Both music and libretto have not been heard by anyone since the early-eighteenth century. Lucy Yates has contributed a masterful translation of Abate Francesco Silvani’s libretto which will be released as a draft during our November 2017 Oratorio Readings and will be released in it’s final—though still early—form in October 2018. We’re confident that her translation successfully conveys the meaning and intention of Silvani’s libretto. However, we want to make it possible for other translators and musical directors to make changes to her translation as they deem necessary in order to highlight their linguistic priorities without having to start a new translation from scratch. Jonathan Woody transcribed the notes from Freschi’s manuscript, and I edited the music and inputted the text, making decisions about how the text corresponds to the musical notes as I went along. My editorial decisions will be reviewed in the rehearsal process for the Oratorio Readings. Through the course of this process, a final—though still early—edition of Freschi’s Giuditta also will be released in October 2018. The same system will guide our exploration of Antonio Draghi’s Giuditta in March 2018, and we will create English and Spanish translations of Niccolò Jommelli’s La Betulia liberata for our Oratorio Readings in May 2018. It might be possible for our organization to bring in a little extra money by selling these editions and translations. However, while we acknowledge and value the contributions of the many people whose ongoing efforts make Academy programs a reality, these oratorios and their librettos are the property of everyone who engages with them. Many people put in a tremendous amount of time and effort into Academy programs. They do this for little or no monetary payment, and it is both important and a privilege for the Academy to recognize and publicize their contributions. We’re grateful to the many musicians, scholars, and writers who contribute to Oratorio Readings, the Journal, and our editions and translations. We chose to use a Creative Commons Attribution-ShareAlike 4.0 license for the editions and translations which enables other people to modify them, and a Creative Commons Attribution-NonCommercial-NoDerivatives 4.0 license for the Academy Journal which enables other people to distribute and reprint articles as they deem appropriate. This balances our need to acknowledge the efforts of Academy members by requiring the attribution of their work on Academy projects with our desire to make what we do through the Academy the starting point for other communities and generations to build on our work. Although our work is already ambitious, we have even larger goals that couldn’t begin to be realized without utilizing copyright licenses that acknowledge both the individual and communal aspects of human identity. Our system for publication makes it more easily possible to spread the stories and music of Baroque-era oratorio and even to begin to re-imagine the way we do research or form communities. If this intrigues you, help us explore Baroque-era sacred dramatic music as a member of the Academy of Sacred Drama. Together as musical professionals, linguists, historians, amateurs, and supporters we can rediscover the perspectives of past ages and explore the world of sacred dramatic music for our own time. We can’t wait to share this fantastic journey with you. Jeremy Rhizor is a Baroque violinist, the artistic director of the Academy of Sacred Drama, and the publisher of the Academy Journal. He dedicates his time to exploring the world of sacred dramatic music and searching for appropriate boundaries in our understanding of what it means to be human.